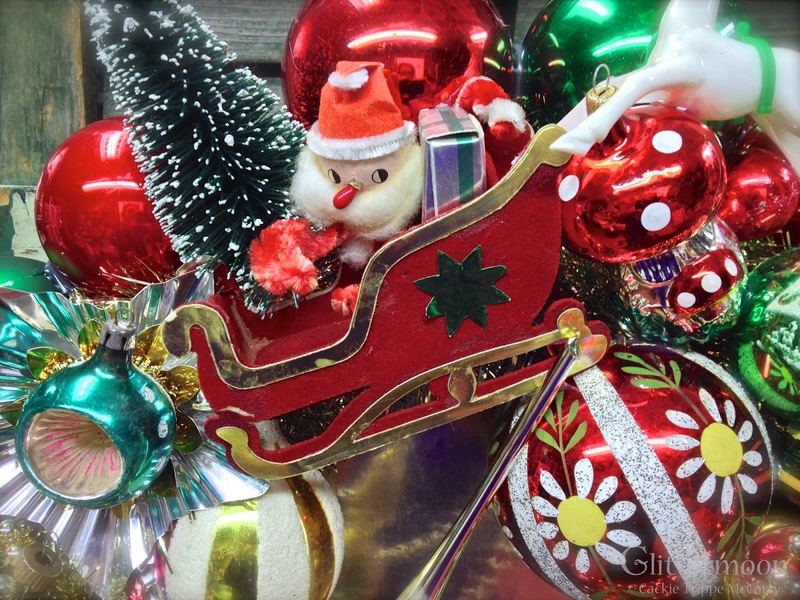 Glittermoon Vintage Christmas – Recycling memories from Christmas past. Unique designs made from ornaments of yesteryear. With occasional detours just for fun. Welcome and thank you for stopping by to visit! To get an overview of what Glittermoon Vintage Christmas is all about, simply keep scrolling down this page. Please click here to check out the latest news on the Blog, to see what I’m working on, where I’m going, and just generally what’s happening in the world of Glittermoon Vintage Christmas. In addition, the Green Menu Bar (at top of page) will take you anywhere you want to go. 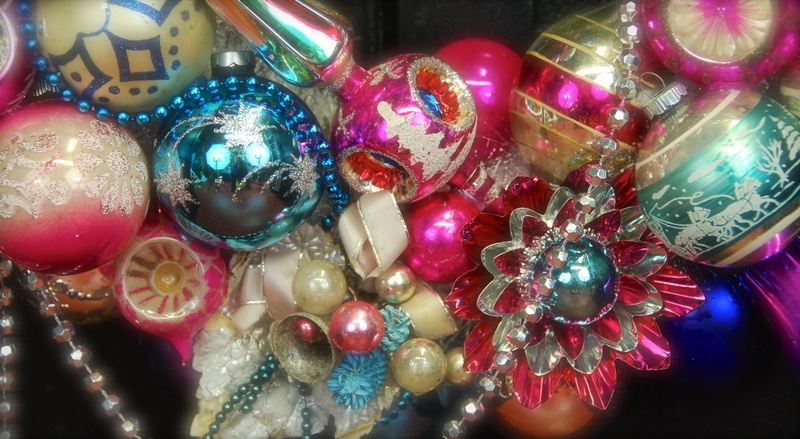 Based in Richmond, Virginia USA, Glittermoon Vintage Christmas’ unique designs are made from ornaments and decorations of yesteryear. Having had a longtime love of old Christmas things, I admire the craftsmanship and creativity that went into making them. But, as a child of the 1950s, I especially love the wonderful memories these pieces evoke. One day, I saw a magazine article about how to make an ornament wreath so I made one for myself using mostly broken ornaments that I loved too much to throw away. It turned out so well I decided to start making them to sell as an adjunct to my other artwork. Every piece I make is unique; there will never be another one like it. This is not only because of the materials themselves (as in what I have in my inventory) but I would be bored to tears if I had to reproduce previous designs. I usually begin each wreath (or centerpiece) with something very special as a focal point. Loving the mental stimulation of design, I let color, scale, and texture drive the composition. Generally, it takes parts of 3 days to make a wreath from start to finish. My wreaths and topiaries have a national following and have been shipped all over the continental USA. I am a proud member of the Beekman 1802 artisan collective (Beekman1802.com, based in upstate NY) and an artisan at the Country Living (Magazine) Fairs. My work has been featured in the Los Angeles Times, R Home Magazine, and the Beekman 1802 Almanac. My wreaths have also been displayed at Zezé Flowers and More & More Antiques, both in Manhattan, and at a handful of other shops on the East Coast. In 2015, one of my wreaths was auctioned at a charity benefit for the Kips Bay Boys & Girls Club in NYC. Mariah Carey owns one of my wreaths – a pink one, naturally. To read more, please go to my About Me page. Click on an image to enlarge. So much better!